Friday’s India budget turned out to be populist, with sops to the middle class and farmers in the form of tax rebate for individuals with <5 lacs salary and cash transfer of 6k per year respectively. While Equity market liked the budget, since it can boost consumption, bond markets and INR reacted adversely. The budget moved the fiscal deficit target for the year to 3.4%. There is a fear that this welfare budget leads to a fiscal slippage and higher borrowing projections and that led to a 15 bp jump in the 10y bond yield. The initial reaction of the bond and currency market is expected given the nature of the budget. But the medium term budget impact on INR could be positive as market perceives that this budget increases the chance of a Modi re-election. While this budget increases the possibility of RBI hold in this week’s policy, we think that RBI could go ahead with a cut, as inflation continues to be sober. The RBI monetary policy is on the 7th Feb. US jobs data, released on Friday, was better than expected. Jobs jumped 304k against an expected 165k. The previous month’s data was revised down to 225k from the earlier 312k. The unemployment rate jumped to 4%, and wage growth was lower than expected (0.1% month-on-month), probably due to the government shutdown. In spite of the large job increase, this release is not enough to move the needle on Fed expectations, as the wage growth still suggests a stable inflation. Dollar is stronger against JPY, jumping from 108.90 to 109.50. EUR is trading around 1.1460. Oil is higher on good US jobs data, and Venezuela concerns. Brent is trading at 62.50. INR would be pressured mildly due to higher oil prices, and also due to the news around DHFL lending practices. This week’s RBI policy is critical for the short term move in the Rupee. In the light of a populist budget, RBI’s take on fiscal deficit and inflation pressure is important. We expect the MPC to move on a rate cut and shift the stance to neutral, in spite of the budget. The next big trigger for global markets is the US-China discussions slated for the middle of Feb. The Rupee has weakened beyond its recent range as worries about fiscal slippage coincided with overall Dollar strength and oil jump. EUR is trading at 1.1440 while JPY is trading just below 110. GBP is weaker at 1.3040 level as no-deal Brexit fears continue to pull the Pound down. Crude is hovering around the 62.50 mark. April-December fiscal deficit is at 112% of the budgeted target. This is actually lower than the deficit for the same period in the previous FY and the last quarter tends to be net revenue positive. RBI policy on the 7th would be in focus primarily for their take on the fiscal slippage possibility. RBI has historically been very clear on its stance that fiscal discipline is of utmost importance for maintaining inflation control. We expect RBI to go ahead with a rate cut, as there is enough room for real rates to turn lower. In global markets, yesterday has been fairly uneventful and can be expected to be so at least this week, as China is closed for their new year. The Dollar is slowly crawling up, regaining the post FOMC losses and the next critical event is the US-China meet scheduled for Feb mid. In spite of a dovish Fed, Dollar is back to its strength and with oil being supported by Venezuela concern and OPEC supply cut outlook, INR is on a mild depreciation path. But, as of now, there are no major triggers which can push the Rupee into a sustained depreciation patch, and one can expect some stability in INR once RBI policy is done with. The Dollar continues its strength, especially against European currencies. EUR is just around 1.14 and having broken the level yesterday once and GBP is trading below 1.30. USDJPY is flat around 109.90. Oil is down from yesterday, with Brent trading at around 62.10. US data this week has been showing some slowdown in economic activity. Factory orders and ISM non-manufacturing data has deteriorated from the previous readings. The labour market though is the strongest spot of the economy and would keep the Fed from being completely dovish. Markets would watch Trump’s State Of The Union speech today for his thinking regarding the border wall proclamation and for hints on the progress of China talks. The three-week temporary spending bill to open the US government would end around the Fed mid, as does the ceasefire with China on tariffs. Next week is critical for trade discussions, as US treasury secretary and others are scheduled to go to China for further rounds. Today the RBI MPC would start its policy meeting, and the statement is expected tomorrow afternoon. INR can be expected to be stable till tomorrow MPC. The Dollar continues its strength, especially as EUR is weak on the back of a bad German economic data release. EUR is trading around 1.1365. AUD crashed after a very dovish assessment from RBA, that they have to budget for a potential slowdown in the economy. AUD is trading at 0.71, from around 0.7230 yesterday. 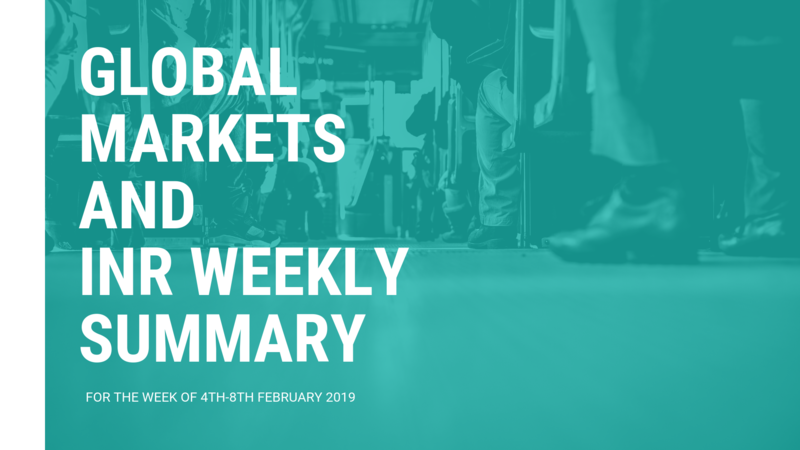 Trump’s State Of The Union address was fairly uneventful for the markets, and there weren’t any significant pointers either on trade wars or the border wall proclamation. Powell, at a speaking event, expressed confidence in the US economy but refrained to discuss economy or monetary policy outlook. RBI monetary policy meeting would conclude with a statement at 11.45 AM IST today. While there is a clear consensus that the policy stance would be changed from ”calibrated tightening” to ‘neutral’, market participants are divided on a rate cut. There is a clear case of a rate cut, given the persistently low inflation, but fiscal slippages and buoyant oil prices can prevent them from going for it. Further, sops to farmers and the middle class can have a potential inflationary impact in the future. Our expectation is for a rate cut, and we see RBI becoming more growth focussed under Shaktikanta Das, especially given that the inflation currently is close to the lower tolerance level of their inflation band (2%-6%). The impact of the policy on INR would be tricky. INR can strengthen if the RBI expresses confidence around the government’s ability to maintain fiscal discipline, irrespective of a cut. But, even a cut followed by a cautious statement around fiscal slippages could lead to INR weakness. RBI policy was on the lines expected by us and delivered a 25 bp rate cut with a change in stance to neutral. Inflation projections for the last quarter of FY 19 and for FY 20 were significantly downgraded, and risks for inflation are projected to be balanced around the central level of the target band. Inflation is projected to reach 3.9% by Sep-Dec 2019, below the 4% target. The RBI governor pointed out that they would be focused on growth also as an objective, and this statement indicates more cuts would follow. Markets liked the policy, and the bond yields fell to 7.5% on the 10y. and INR strengthened to 71.30 level. The Dollar is stronger, with EUR trading lower at 1.1340 as the European Commission slashed EU GDP forecast for 2019 from 1.9% to 1.3%. JPY is mildly stronger due to risk aversion arising out of comments from Trump administration officials that China and the US have yet to bridge a large gap. There was also a news report that Trump-Xi meeting might not happen before the March 1st truce deadline. Dow fell 200 points and Brent is down to 61.30. BOE, in their policy, reduced UK GDP forecast citing large uncertainty due to Brexit. GBP is lower trading at 1.2950 level. INR range is intact and it is now a tussle between lower oil prices and risk aversion on concerns around China talks. Both are neutralising each other for now, we expect INR to meander along till a concrete statement from next week’s trade talks is out.